« Green Streets The Movie! Marty Golden ran the Town Hall meeting about Green Streets since he was the one who called it. It started out like any other meeting by thanking everyone involved, including: the DOT, 61st Precinct, GB Cares, Property Owners, CB 15 Chair Theresa Scavo, 277 principal Mrs. Fish, Cort Club,Vollies etc. Marty gave a summary of how Green Streets came to be and explained that the proposal has been in the works since June 2006 or 18 months. Its goal was to bring down the number of accidents, loss of life, and to create additional parking by 277, Larry Veiling baseball field and Seba Avenue Skate Park. The DOT then gave their presentation, which went well even though they were up against a tough crowd. 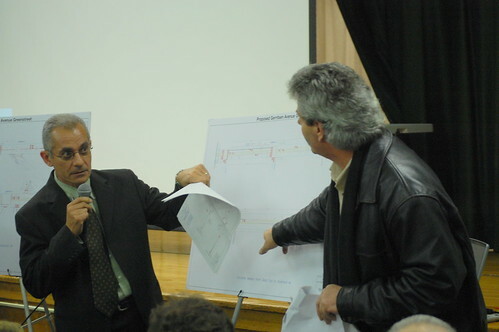 Then, after a resident went toe to toe with the DOT arguing about street widths, Marty Golden killed Green Streets 35 minutes after the meeting had started. If there were any people in the meeting that were for Green Streets they didn’t say anything or make their case for it. Since there were so many people attending the meeting Marty opened the floor to hear about any issues that the community wanted to discuss. The community talked about the kids that use the median as their own personal road, a street light at Channel Avenue and Gerritsen Avenue, and a bike path on the park land from 277 to the point. I also video taped the meeting but its going to me a day or two to edit. This is why this website is so important, kudos to you webmaster for bringing this site up and making everyone aware of the issues in this neighborhood. You see you put it out there, make people aware and they will respond. And you said we didn’t care, we do. We have the information highway and need to utilize it. I also hope that we have this outpouring of support when it comes time to discuss the Lacon Court project. Fingers crossed on that one. Many issues to consider there. I’m sorry that this comunity is not green, this would have beautified the ave. and made it look not so industrial (slumish). I’ve seen this in other comunity who have done this and it looks great (green), maybe if the committee that proposed this, maybe if they had pictures of how a already done area looks like this may have swayed some to look at this diff. I could not make this meeting, i don’t think anyone whats the FLU..
What a sad day for your community. Congratulations on keeping your ugly, dangerous, environmentally-unfriendly road intact. What a victory! Nice work Dan!!! Way to go. a- sad day? Try driving pass 277 NOW when school lets out, and then imagine throwing a cement sidewalk in the middle. I’m not sure what your visualizing in your minds eye, but it must be beautiful enough to sit and stare at for 20 minutes while waiting for someone that jumped out of their car to get the paper or milk. Environmentally-unfriendly? Did they plan on collecting water from the leaves of the new trees? Solar panels the tops to juice the street lights? We have plenty of green. Are you blind? Look at the fields that are well maintained by GB Cares and members of this community. I have more green than my allergies can stand, thank you very much. It is a happy day for us and our community is beautiful as it is. “A slum, as defined by the United Nations agency UN-HABITAT, is a run-down area of a city characterized by substandard housing and squalor and lacking in tenure security. Shoulda used a better choice of words….cuz I don’t think this describes gb…. Agreed. Directly east of the ave. is probably the greenest environments in Brooklyn next to Prospect Park, and Greenwood Cemetery. You make it sound like we live in Red hook. I was at the meeting last night and talked to many people . most against green street but some were for it . What amazed me was the ones that were for it all said the same thing . It will bring the property value way up . Its just my opinion but I think these people That claim to be worried about the safety of our children are more worried about the selling of Gerritsen Beach . Stupid comments from you treesaregreen. Yes, something like this would be nice if, and only if there was enough room. There were pretty pictures at the meeting of Cross Bay Blvd and how nice it looks. Cross Bay Blvd is three times the size of this whole Avenue. 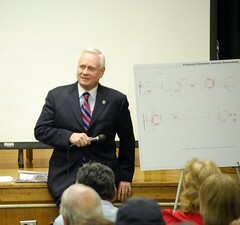 When the Gerritsen Beach Resident went “toe to toe” witht he Dot Rep, that’s because they didn’t do their homework. The measurements that they were giving were wrong. There would be no room for emergency vehicles to pass. There were many represents from emergency services, they were all are residents. None of them were there in a official capacity so they didn’t speak on the record. Off the record, they all agreed, emergency vehicles could never make the pass if a car was double parked or even worse yet, broken down. Somebody said at the meeting yesterday, we are not a normal community, we are very unique. That is so true and therfore, what has worked in other areas will never work here. We could develop the Park Lands across the street, make some parking for the sports events, even make a bike lane. How about developing that run down park on the side of Ave X for some teacher parking? That kind of talk will have us waiting another 18 months for something on paper. Too slow people!!! Too slow. The lines in the middle have slowed down traffic but you will always have, hope you idiots are reading, the idiots who want to go 90 miles per hour down the center. Your turn will come when unfortunately you hit somebody and spend the rest of your life behind bars. That will be a dam shame. I have curb appeal for my properly value assessment tells me so. Where were the raised hands of the pro-greenies if their opinions were so strong? Put up a good fight if you feel that strongly. Majority rules and apparently RULED. If parents where not illegally parked this would be NO problem…..(it would be safer) and plenty of room to pass the school safely! I said (slumish – not slum) the 1st time i drove down the Ave. i thought it was to industrial looking and still think it do’s…..
I’ve seen communities that have a way more narrow street than the Ave. do this and emergency vehicles have NO PROBLEM passing! plenty of green yes on swamp land, that is only still there because No one wants to try to build on it, or it would have been scooped up years ago. parks dept. may own that land but if it was not so swampy someone would be heart-up to get there hands on it . Er, um, “hard-up” not “heart-up”. I think it do’s not look industrial in the least. You want industry? Take a drive to Red Hook as the gentleman pointed out earlier. Not all is swamp land and I’d prefer it NOT to ever be built upon. Over-develolpment or developed upon? Not for me. I’ll hug those trees and weeds till the day I die. treesaregreen, that land was given to NYC by the Whitney family with the terms that it can only be used as park land. It can not be “scooped up” by anybody. You must be new to the area or do not live here at all. Come clean, you have an agenda. treesaregreen, why don’t you move to one of these communities that have been beautified by greenstreets? if the beach is so “industrial” then get out. i can personally tell you that some pro-green streets people didn’t speak up at the meeting last night because: 1. we just wanted to see the plan and listen to DOT, and 2. The vibe from the anti-green streeters was so thoroughly hostile, irrational and bullying. Beachnut: Even though there might have been pro’s for the green-streets, don’t you feel that the negatives far out-weighed the positives? I’m not trying to be rude by any means, but just one point to make, looking nice is one thing but safety in an emergency are two complete opposites sides of the spectrum. (I know there were more points, I just highlighted these two as a ‘for instance’). I respect people’s concerns but, no, I thought this was a really nice plan, I think the community had a kind of knee-jerk negative reaction to it. I don’t think a convincing case has been made that the negatives outweigh the positives. Let’s ask the Fire Department what they think about the street design. If they’re OK with it, then I’m OK with it. These kinds of medians are working perfectly well on lots of streets throughout the city. DOT is always very conscious of the needs of emergency and sanitation vehicles in their street designs. I doubt FDNY would have a problem with it. But did we even ask? As for a once-in-50-years-hurricane type of emergency: Evacuations would be called for with, at least, 12 hours notice and probably more like 24 hours. The City (or individual drivers) would use BOTH sides of the avenue to evacuate, doubling the capacity of the street. Evacuating southern Brooklyn is going to be a challenge, regardless. I don’t think a planted median on our avenue significantly adds to that challenge, however. But I’d like to see a professional traffic engineer run the capacity numbers and answer that question for us before being chased out of the auditorium. I agree with you Mike. It is a matter of time before someone is hurt or killed on Gerritsen Ave. again. People are afraid of change. Who can deny the Ave. is better and safer now then it was a few years ago? The people were also up in arms over that change too. If an accident is going to happen, its going to happen regardless of what you try to do for safety. Hate to be so blunt but it is what it is. Out of curiosity I personally spoke to a fire department (not volunteer) and asked their opinion on the green street idea for this particular area and they were not in agreement as far as it being a good idea in getting to a fire, life threatening situation or otherwise. Bottom line was that they thought the street would be far too narrow to maneuver around quickly. when you drop off your child, do you double park??? I saw the DOT outside 277 yesterday, hopefully handing out parking tickets, that may be a better deterent then making the sreets narrower. Has anyone else noticed the Fedex truck parking in the middle of the avenue now that the lines are there? Guess that’s a new parking area. Can’t beleive it took painted lines for people to realize that when soemone is making a left turn on the avenue, those behind should GO AROUND THE CAR NOT TRY DRIVING THROUGH IT. Sorry mike24611, I don’t know who in the crowd you were looking at, but I am a 30-something… and I saw a VERY mixed crowd- a majority of them in their early 40s. I would imagine because that is the average age of a HOME OWNER down here. Granted there will always be idiots racing down the avenue- some of them don’t even live here. This is called being an invincible- 20 yrs old- and stupid. Greenstreets will not help or hinder this. The fact is, that yes it will look pretty, but is just too dangerous to block the main and only pipeline to the whole community. Well said Debbie. To be fair, it was a very mixed crowd age-wise. I did not see FedEx in the middle, but did see Con Ed’s truck just yesterday with their new poles in tow. They were there for quite a while too I might add. Narrowing the lines may be beneficial, as was brought up by our prop owners president. I have gotten used to the lines and don’t mind them but feel its def. dangerous for the kids that play in them. Tickets too may be a good deterrent. Good point. Guess what, you are legally allowed to double park in the no through lane outside of PS277 when dropping off and picking up your child. You are not allowed to double park by the park, at the bus stop or ever at any fire hydrants. Those of you who have no kids in PS277, my advice to you is….SHUT THE F UP. There is no where to park. All the side streets are taken up by either residents or teachers. Walking is defintely an option that is used during the nice weather. During the bad weather, we don’t want our kids to get cold, rained on or whatever. My advice to you again if you don’t have kids in PS277, then you should damn well know don’t go near the school in the morning at drop off time and in the aftenoon at pick up time. It is merely a half hour each time that the Ave is congested by the school. Drive down the side streets or do you get off by going up there and getting enraged? Anger managment is defintely requred for some of you people. As for the Fire Dept, I asked, they weren’t invited because guess what, THEY DON’T AGREE!!!! The fire Dept wasn’t invited not because THEY DON’T AGREE, but because this was just a preliminary meeting to see if THE NEIGHBORHOOD wanted it. If yes, then the FD along with other agencies would have been invited to the next meeting. That won’t happen now because Mike is right. And if e1 can double park to drop off kids and run into get a six pack then why can’t the trucks park in the middle? Prejudiced? Danger is danger except when its convenient for us to do. I guess its more important to you that your kids get to skewl warm and dry rather than safely. Have you considered walking your child to school? I have never heard of legally double parking but if you say so. You can’t Legally park in the bus stops or double park by the park yet, most people do. By the way when I take Dictum Ct. out of the beach most mornings to avoid the traffic. Its coming home in the afternoon & trying to make the turn onto the Ave. from the park that is upsetting, there are so many cars triple parked you an not see oncoming traffic. But I guess I should just find a new way home rahter than parents not blocking gerristen ave twice a day. The double parking outside PS 277 is ridiculous. I am a parent whose children go to the school. I park my car & walk to pick up my kids. I always find a legal spot within 1 or 2 blocks of the school. My children have almost been hit twice by parents who double park and make crazy U turns in front of the school. I don’t know if green streets was the solution (I don’t know enough about it), but I do know some tickets wouldn’t hurt. When I went to the meeting that night, I was still undecided about what would be put into place concerning green streets. Originally, I thought it would be a good idea because our avenue does look very commercial. 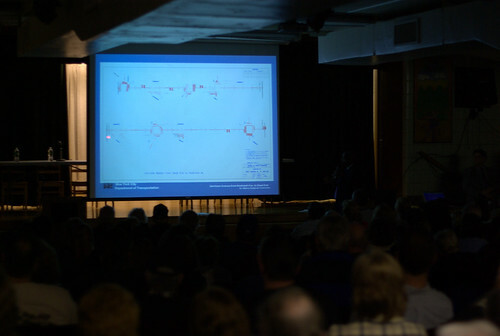 Once I heard the DOT and their engineer, speaking it was apparent that they really did not know the real impacts that this type of construction would have on the community and they did not really understand their own drawings and details. I do think however that there are solutions to the double parked cars and yellow buses in front of the school. There is an area directly behind the school, which could be utilized if a road was built as a student drop off area, one way in and one way out, a circle type road. The entrance road could be built at the area where the GB cares storage containers now presently preside to the back of the cafeteria in the space that is directly adjacent to the softball fields; this could elevate all of the congestion in front of the school. This parkland (the weeds) is not utilized and bug infested. There would have to be a traffic light put in this area to allow cars and buses to exit safely and this traffic light would ultimately solve a long ongoing issue right off Channel Avenue at the south end of the school. As for the avenue itself, ultimately the best way to slow traffic other than green streets as proposed, is to put into place stop signs and cross walks at nearly every bus stop from the school to the end of the avenue. I know this would be an inconvenience to the many people who race up the avenue to go to and from work and/or drop their kids of because they are running late but this is what I can see as the only alterative. If you were to look down the avenue 60 years ago, you would have seen a quaint little fishing town rarely seen in Brooklyn with its old fashion streetlights, clean streets and a miles worth of greenery. Now in most parts it looks like a commercial delivery zone. Poor planning on the cityâ€™s part. This to could be reconciled, a real plan could be developed in a way to eliminate all of the deteriorating telephone poles along the avenue by placing the utilities underground (phones, cable) and installing electrical transformer boxes on the sidewalk which in turn could be surrounded by shrubbery. Trees could be planted, planter boxes could be setup, there are many things that could be done but it is up the community to decide this, not the parks department, DOT or our local politicians. If we as a community stood up and really put our heads together, we could as a united community gets things done, our way. This of course is not an easy task but it could be done as seen in many other neighborhoods. It takes unification and determination. You could forget about getting anything done in GB, people don’t like change and the DOT got the picture. The above plans are just pipedreams now, we together as a group should have been more open minded and presented some of our own ideas instead of screaming and acting like we know it all. a little late, but I just wanted to applaud this site for the coverage of the neighborhood! When the site first launched, one of the things I was hoping to see were the community meetings online, a little youtube magic and we got it! Thanks! I agree, also there is a story in today’s Bay News issue that says green streets isn’t as dead as we think. You are right; we should have presented our own ideas at the meeting. I donâ€™t think it was a matter of people being know-it-alls, I think it was because of the way it was presented at the last minute for most of us. The meeting notice came out one week prior to the meeting on the 13th with the headline (Town Hall Meeting to Finalize Green Streets). 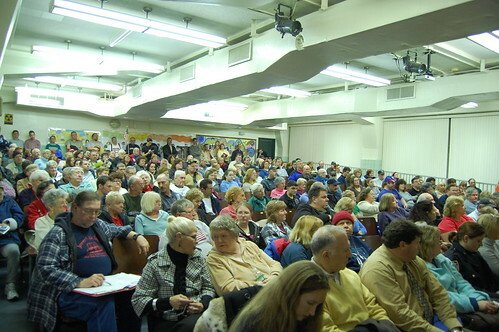 Change could happen if our community groups worked together and put a plan together then presented it to the entire community themselves (Town hall meeting) and not at the last minute with our local politicians, leave them out until we are ready, poor community planning. I do believe however, it is never too late for change, and I also believe that the community would welcome change if it is brought to them with more frequency and not to just a couple of community interest groups before it presented in the fashion it was. This is precisely why it is important to attend Property Owners meetings, people. Very important. This is where it all begins. This is where you find out information before ‘last minute’. This is where we all can come together to as a community and talk about things, good, bad or indifferent. You might not always agree, you might not like what you hear, or you may; but it is a way of being in the know and having a voice. This is why we have it.